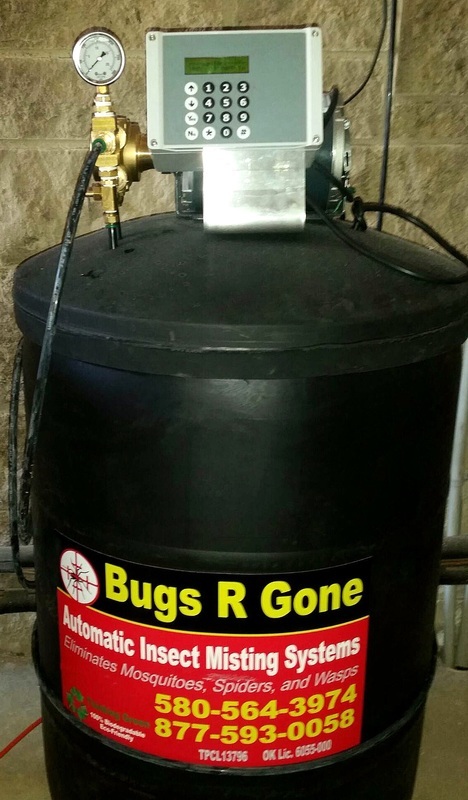 Bugs R Gone provides an automatic anti-insect misting system attached under the eaves of your building or in similar aesthetically pleasing but functional areas. The system is attached to a computerized timer and 55-gallon tank, usually installed in a garage or utility room out of sight. The system plugs in to a standard 110 outlet and requires no special plumbing. The system comes with an internal 30-day battery backup in case of power outage. brass and stainless steel nozzles to insure longevity of the system. Nozzles are attached every eight to ten feet. The color of the tubing and nozzles can be coordinated to the color of your building. Our timer system is easy to operate, and instructions are included directly on the timer itself. We will also gladly service your system and make any adjustments to your timer’s programming. During the first month of operation, we will check your system regularly, which also gives us an opportunity to help you learn how the timer works.